Good morning, or, I mean evening! I get confused on these egg recipes ya know. (wasn't that funny) We eat them at our house morning, noon and night. No time is a wrong time for an egg recipe or breakfast recipe at our house! So how many of you make egg in a nest? Toad in a hole? Bird in a nest? Frog on the pond? You know what I am talking about, don't you? I think we have even had the discussion on social media, on what you call it! If you call it something different you will have to let me know in the comments! Regardless of what you call it, I call it perfect for any meal! This recipe is just a bit of a "grown up" version, which I only say because some would consider this fancy enough for serving guests where they might not serve a plain ol' frog on the pond! I was inspired by a photo my husband sent me. It was similar to this, but I could find no recipe, only a photo. After a couple of tried both of which were fantastic, I found the way I wanted to share with you all. I know eggs are skyrocketing in price especially here in the Midwest, but when you find a good deal, stock up and make this! Here we go, on this fah-nsah nan-sah version of whatever you call it! Preheat your oven to 375. Using about a 2 inch cookie or biscuit cutter, cut through the top layer of your bread. Using a serrated knife cut out the circle and dig out the bread halfway down to the bottom. 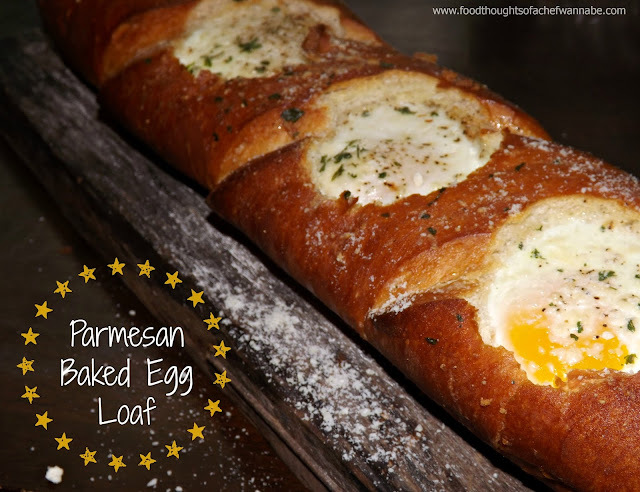 Be careful not to pierce the bottom of the loaf we don't need leaky eggs! Now, brush this loaf with melted butter. Use every last drop of that butter, don't let me catch you leaving a little behind. Just don't! Drop an egg into each hole, then sprinkle with parmesan cheese, salt and pepper and parsley. Now, pop this bad girl into the oven, for 18-23 minutes. You want the yolks to still jiggle, and the whites to ALMOST be firm. They will carryover cook, so take them out shy of the whites being completely firm. Let it cool for a few minutes and cut into 4 pieces or 2 pieces if you are serving 2 to each person. If you are serving more than 2 or 4 people, well, get another loaf out kids! I love these and one was so filling!! !